The administrative wheels turned slowly but finally in 1959 the Navy got ready to release some of its property in Wedgwood for the site of a much-needed elementary school. In September 1961 Decatur School opened at 7711 43rd Ave NE. It was still surrounded on its block by Shearwater housing for Navy personnel, and the first students at Decatur were almost all from Navy families. Other proposed plans for parts of the school site were resisted by the community, such as a post office to face 40th Ave NE or a city water tower at the corner of NE 80th Street and 40th Ave NE. By 1966 an addition had been built to the school building and the rest of the block kept as a playground and sports field as it is today, for a total of ten acres on the Decatur School site. According to the Seattle Public Schools history page, “Shearwater Elementary School” was proposed as the name for the new school, but some Wedgwood residents objected. They believed that the Shearwater housing would soon be torn down and there would be no remaining vestiges of Navy housing in Wedgwood, so they didn’t want the name “Shearwater” retained. Wedgwood parents living near the site did not want to send their children to a school named for what had become slum housing, as the school was surrounded by blocks of deteriorating wooden barracks buildings. Seattle settlers took refuge in a blockhouse on January 26, 1856. Painting by Emily Inez Denny courtesy of MOHAI. As an alternative, the new school was named after Stephen Decatur, an American Naval officer who was a hero of the War of 1812. A second association of the name Decatur was a reference to “the ship which saved Seattle.” At the Battle of Seattle on January 26, 1856, which was part of the Puget Sound Indian War, white settlers took refuge in a blockhouse on the present site of First & Cherry Streets in downtown Seattle. They could not see beyond the tree line which was at Third Avenue, where gunfire came from Indian attackers. The US Sloop-of-War Decatur came into Elliott Bay and by firing cannonballs up onto the hillside, repelled the attack and saved the lives of Seattle’s early residents. In the summer of 1957 the Wedgwood Community Club had been victorious in getting the Seattle City Council to vote that the Shearwater area should be zoned for single-family housing only. It was thought this meant that the Navy would take action to tear down the deteriorating housing. The August 1957 edition of the community council newspaper, the Wedgwood Echo, (above) told of communication with Congressman Jack Westland (US House of Representatives 1953 to 1965; Congressman Westland was elected to the seat vacated by Henry M. Jackson when Jackson advanced to the US Senate.) Congressman Westland wrote to the Wedgwood Community Club to say that the Navy planned to build “Capehart housing” somewhere in Seattle to compensate for the loss of Shearwater. Capehart was the name of a government program for private contractors to build duplexes which would then be turned over to military use. Since the Capeharts could only be built in areas zoned for multiple dwellings, readers of the Wedgwood Echo understood the message that was being sent: Shearwater would be torn down and could not be replaced with other military housing, because Wedgwood’s Shearwater area had been rezoned single-family-only as of 1957. Shearwater barracks buildings as photographed in 1961. Courtesy of the National Archives of Seattle. But nothing seemed to work until Washington State’s powerful US Senators, Henry M. Jackson and Warren G. Magnuson, stepped in. Known collectively as “Scoop and Maggie,” US Senators Jackson and Magnuson were completely different in character and lifestyle but together the two men were a dynamic duo. They worked together for twenty-eight years in Congress, 1952 to 1980, and were able to bring in a steady stream of military contracts and federal appropriations funding for their home state. It was said that the survival of Boeing Aircraft Company depended upon the senators who were able to get military contracts for them, and that while the two senators were in office, Washington State consistently got more than its share of federal funds. Senator Jackson was on the powerful US Senate Armed Services Committee. In January 1965 Senator Jackson proposed a bill which went through the committee and was approved in Congress, that the Navy’s Shearwater housing in Wedgwood should be vacated and the property should be sold. Finally, with this order by Congressional authority, the Navy gave a date of July 1, 1965, as the deadline when all remaining Navy personnel had to move out of Shearwater. The next step in the Shearwater process was the effort to get the slow-moving General Services Administration of the federal government to arrange for sale of the Shearwater property. On September 1, 1965, the GSA acted to transfer ownership to Seattle Public Schools of the rest of the block where the Decatur School, 7711 43rd Ave NE, had been built in 1961. The school district paid for the tear-down of the eighteen remaining Shearwater buildings on that block, and made a 1966 addition to the Decatur School at the southern end of the building. The rest of the block was left as playground and athletic fields for a total of ten acres, as the site is today. Another controversy erupted in October 1965 when it was learned that the GSA had no plans to tear down the Shearwater buildings which remained on several streets surrounding the Decatur School block. GSA officials said that they had a responsibility to the taxpayers to sell the property at the best possible price and that the tracts would fetch higher bids if the buildings were left intact. This implied that a buyer of the Shearwater land parcels might conceivably use the buildings as-is for rental property income. The Wedgwood Community Club renewed their efforts to get the buildings removed. The Wedgwood Community Club, joined by the View Ridge Community Club and once again with the help of City Councilman Clarence F. Massart, all united in efforts to have the Shearwater structures abated as a public nuisance and torn down. Senators Jackson and Magnuson joined the fray, asking the GSA to delay the sale until it could be determined whether the GSA had authority to tear down the buildings itself. City Councilmember Jeannette Williams and Sen. Warren Magnuson at the dedication of Magnuson Park in 1977. Another person who was influential in helping to get the Shearwater problem resolved was Jeanette Williams who lived in the View Ridge neighborhood. She served on Seattle City Council from 1969 to 1989 but even before taking political office, Mrs. Williams was politically influential. In 1962 Mrs. Williams became chairwoman of the King County Democrats organization. As such, she had the ear of elected officials as to what voters wanted. 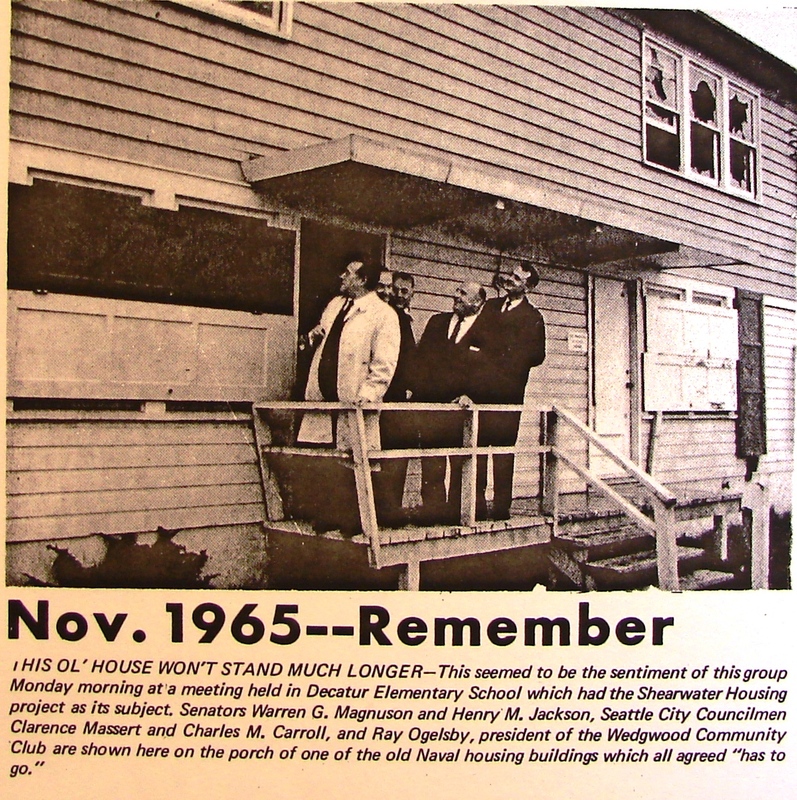 What northeast Seattle voters wanted was the removal of the badly deteriorated, vacant and boarded-up Shearwater housing, and Mrs. Williams made this clear to Senators Jackson and Magnuson on their November 8, 1965 visit to the site. 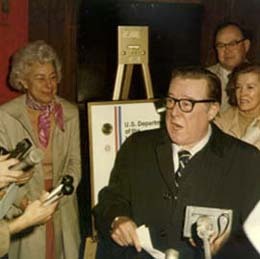 Senator Magnuson indicated that the very next day, he would see the director of the General Services Administration at a meeting in Pasco, eastern Washington. This key timing was the final turning point in resolving the Shearwater problem. The 1965 auction materials showed Decatur School (white roof) surrounded on its site by Shearwater barracks buildings. The government real estate auction was finally set for December 16, 1965, at the Seattle Center Coliseum. The Shearwater auction brochure. Photo courtesy of the National Archives of Seattle. 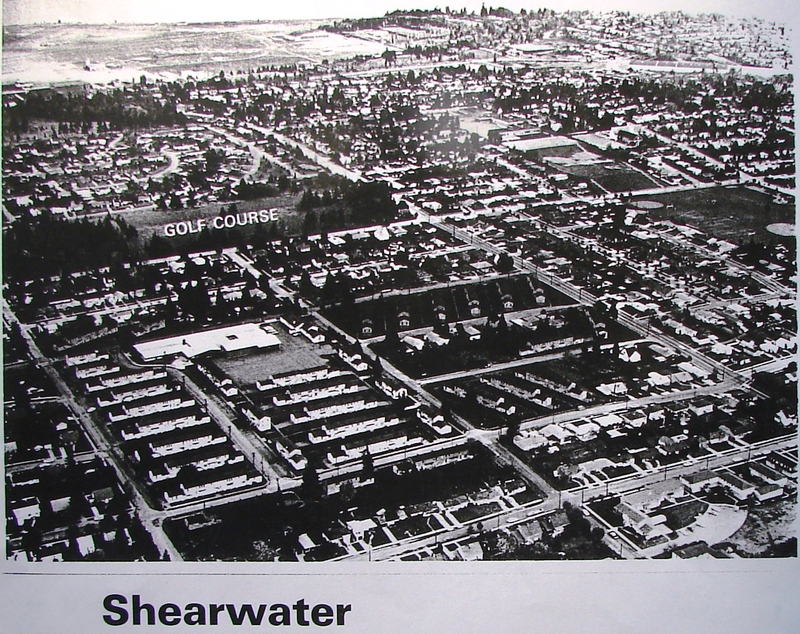 In news articles about the sale of the Shearwater properties, it was mentioned that as of the Seattle City Council zoning decision of 1957, the Shearwater blocks were zoned single-family and could therefore be replaced only by houses, not by apartments or other multiple-zoned buildings. The 1965 auction notice clearly listed the property description, the single-family zoning, and that the winning bidder must remove the barracks buildings within ninety days. After the auction, the type of housing which would replace Shearwater became the next controversy in the long-running saga. Continued in Part Four of the Shearwater story: the developer and the Wedgwood Community Club don’t see eye to eye. This entry was posted in community club (old), Controversies, School histories, Shearwater and tagged Navy housing in Wedgwood, Neighborhood History, Seattle. Bookmark the permalink.